The North Philly native and rapper Meek Mill surprised Temple students with his visit to his old neighborhood on 18th and Berks before his concert at the Wells Fargo Center yesterday. Junior, Rachel DeLucy told The Tab, she was walking to her friend’s house when she noticed a huge crowd surrounding the rapper. Rachel and other Temple students even made a quick appearance on Meek’s Instagram story. Rachel tweeted a video of the famous rapper walking down the block yesterday and the tweet has now received over 500 retweets. 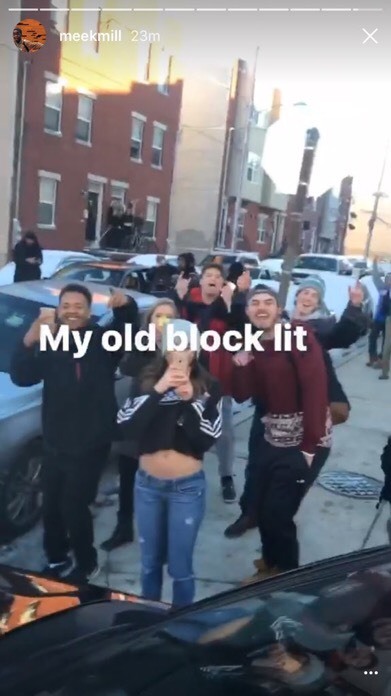 This is certainly not the first time students have spotted Meek on the streets of North Philadelphia since the rapper has shown his obvious love and pride for his old neighborhood. He also posted a photo on the stoop of 1836 18th Street along with a throwback picture featuring his fellow North Philly friends. It’s pretty safe to say that Temple students love Meek Mill and Meek Mill loves us right back.